Service personnel from the U.S. and Singapore have begun a two-week annual military exercise at Changi Naval Base in Singapore in an effort to train servicemembers on land- and maritime-based missions in multiple combat areas. The U.S. Navy and the U.S. Marine Corps held the opening ceremonies for the 22nd Cooperation Afloat Readiness and Training exercise Tuesday with Singapore’s armed forces, the Navy reported Tuesday. The exercise also aims to build up bilateral relations and interoperability as well as address maritime security issues faced by both countries, according to the report. 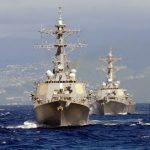 The U.S.’ and Singapore’s naval forces will participate in the inaugural ship anti-submarine warfare readiness/effectiveness measuring exercise that seeks to evaluate the capacity of aircraft and surface ships to detect submarines. Other at-sea training activities at CARAT Singapore 2016 include gunnery and air defense exercises, surface warfare and anti-submarine warfare training, cross-deck helicopter as well as visit, board, search and seizure operations. The Navy and Marine Corps will use several U.S. assets at the training exercise such as USNS Millinocket (T-EPF-3) expeditionary fast transport ship and Arleigh Burke-class destroyer ships USS Spruance (DDG 111) and USS Stethem (DDG 63). Both U.S. service branches also conduct bilateral, annual naval exercises with the armed forces of Bangladesh, Brunei, Cambodia, Indonesia, Malaysia, Thailand, Timor-Leste and the Philippines as part of the CARAT program.